After writing this post, I sent an email to the EPA regarding our questions about the EPA Superfund cleanup project going on in our south Minneapolis neighborhood. - Are there are alternatives to replacing the lawn with native species or a rock garden? Would the EPA consider using native species for replanting? We start with the premise that we will replace like with like. So if someone has a chainlink fence, and we need to replace it we will go in planning to replace it with a chain link fence. However, we are willing to be flexible in our approach to the restoration of the properties. In considering requests like those you've proposed people need to keep in mind that we are not doing this cleanup to improve people's landscaping. We are doing it to provide a safe yard. The controlling factor in considering these types of request is that our work cannot result in a "betterment" of the property. 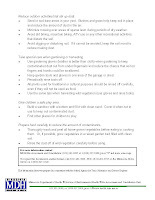 Practically speaking this means that we will not replace one item with another item that is of a higher cost. We would have to look at the cost of replacing a lawn with native vegetation before we could agree, but it sounds like it is possible. However, replacing a lawn with a rock garden would not likely be o.k. because of the increased cost of materials and labor. We may be willing to consider a situation where the owner independently negotiates with the contractor for a rock garden, but EPA would pay for a portion of that work equivalent to what reseeding the lawn might have cost. The owner would be responsible for overseeing the installation of that material themselves. - Should we hold off on installing that new sidewalk and patio that we were going to install? If people have plans for work like that I have told people not to necessarily hold off. I cannot say when cleanup work on the property will happen. It may happen next summer, but it also may take a few years to get done. This is because we have close to 500 properties to cleanup and also because we don't know when funding will be available to start work. The earliest we could start this work would be next summer. 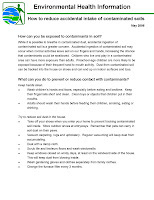 So my advice to people is to just do what you think you need to do, with the understanding that you should try to follow the suggestions in the attached fact sheet* - "How to reduce accidental intake of contaminated soils". Once we start work we will try to avoid taking equipment over sidewalks and patios, but some times it is unavoidable. If we damage it we will replace or repair it. We are still working on the exact specifications for the landscaping contractor, but generally we include several weeks of watering after the planting. The idea is for us to water the reseeded lawns until they have started to grow. At the same time they will water any other plants that were replanted. After that initial period of planting and watering it will be the homeowners responsibility to water the plants. -Will they be removing the soil directly next to our house? Will our foundation be compromised? That's a lot of soil to remove and if it cracks while they are working, we could have issues down the road. The excavations require a slope at the sides of the excavation to avoid side walls from falling into the hole. So by necessity we would not be able to dig immediately next to a house. Our desire is to stay away from the foundation for the very reasons you are concerned. If digging close to the house is required we likely would hand dig that area. Before starting work we will video document the condition of the property, including the condition of the foundation. A copy of the video will be provided to you. We will do the same when we are done with the work. This is to protect both the homeowner and the contractor when it comes to claims of damage. If we damage something we will repair, or replace it. -How will water drain off our property? The last thing we want is water running into our house the first time it rains (or snows) more than an inch. Our goal is to return the property to its original condition, to the extent that we can, including drainage. There have been instances where the ground sloped toward a house before we started and we sloped it away when we were done to improve drainage. We try, as best we can, to match the original compaction of the soil to make sure the ground drains the way it originally did. We have run into some issues with drainage in the past, but we have always returned to correct any problems if we caused them. -Are they going to cut down our trees so they can remove the contaminated soil? We're not particularly attached to our trees, but we'd like to know. We generally try to hand dig around trees to avoid damaging the root systems and have been pretty successful up to this point. If there is some question about whether a tree will survive even hand digging we could do additional sampling to make sure the soil needs to come out from around the tree, or just agree to remove the tree and replace it when we are done. These questions are going to come down to property specific issues that we will work through with the homeowner before we start work. this seems like a nightmare. I am really impressed with the EPA's response. Your questions were answered quickly and thoroughly, and their logical approach to solving the problem will leave you high and dry ... which is what you want! I agree with Mark. ROKK!